So there I was sitting on the bench enjoying the last of the sunshine when a dragonfly landed on my welly and sat there for about 5 minutes – it seemed so much longer. Do you know the feeling you get when a butterfly lands on you? A mixture of wonder and magic, and you hold your breath for fear of scaring it off. One of those moments when you wish you had your camera!!!! The dragonfly was very shiny and we came to the conclusion that it had just hatched from our pond and this had been it’s first flight. It sat on the foot of my welly and dried itself in the warm sunshine. A very special moment. Then it flew away. It reminded us of another time and place when we watched a nymph crawl up a stem then over a period hatch out of its casing and turn into a beautiful dragonfly. 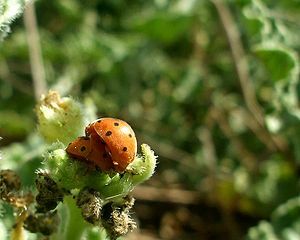 Ladybirds – How many do you have on your smallholding?